Another Batman villain! Today I'm diving into Harvey Dent, aka Two-Face. I should note that I have a little thing for Tommy Lee Jones. Even with that gruesome half-face. This was super easy - Libra! 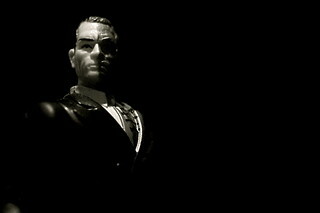 When Two-Face was Harvey Dent, he was a lawyer - that's Libra or Sagittarius. I went with Libra because he's so vacillating, that's Libra all the way (I should know as a vacillating Libra!). He can't make up his mind so he has to flip a coin. It's the fairest way to make a decision, and Libra is so concerned with being fair. To bring in the Sagittarius energy, I'd say his Sun is in the 9th house. The Libra Sun-9th house combo screams lawyer, and with the 9th house, shows he's intelligent, looks at the big picture, and very tied to his own beliefs. Screw everyone else! This would make him an Aquarius rising, which is interesting because he has an unusual look with his half-scarred face. I'm going with Gemini here. Gemini is known for being a two-faced sign (not meant as an offense to Geminis!) because it's a dual sign. The symbol for Gemini is the Twins, and Gemini is known for having several faces. It would also give him more air energy, an air triad actually, which I feel he has. Air energy makes you live in your head, detached from feeling. With an Aquarius rising, that would put his Moon in the 5th house, making him theatrical and wanting attention (like the Joker with Moon in Leo! it strikes me that villains want attention a lot). Since Mercury doesn't travel very far from the Sun, his Mercury can only be in Virgo, Libra, or Scorpio. Since he comes up with such vile plans, and seems to have a bit of a temper, I'd go with Scorpio. That would also make him more obsessive, dark, and have an unrelenting mind. Mercury would be in the 10th house, which makes him focused on his goals (killing Batman), always planning and trying to be realistic with his plans (to kill Batman). Also shows using words in your career (like a lawyer trying to convince people of his case; in The Dark Knight, Harvey is good with words). This would also make his Mercury conjunct Batman's Scorpio Sun. I'm thinking Leo for Venus, for the same reason I chose the sign I did for the Joker: Leo would put his Venus in the 7th house of open enemies, the enemies you know about, like Batman. It also shows an affinity for Batman, his enemy. In Two-Face's case, the Leo Venus would also add to his need for attention. I put his Mars in Aries or Aquarius because of the scarring on his face. The face is ruled by Aries/1st house, and the Sun rules the self. If his Mars is in Aries, it's opposite his Sun, which can show the violence involving his face. If his Mars is in Aquarius, it's in his 1st house, which again can show the violence with his face.